The TWiVniks explain how the three-dimensional structure of the giant Cafeteria roenbergensis virus suggests a new mode of assembly, and the apparent elimination of dengue fever in an Australian city by release of mosquitoes harboring Wolbachia. The TWiViridae review the 2017 Nobel Prizes for cryoEM and circadian rhythms, and discuss modulation of plant virus replication by RNA methylation. From ASV 2017 in Madison, Wisconsin, the complete TWiV team speaks with Mavis Agbandje-McKenna about her career and her work solving virus structures by x-ray crystallography and cryo-electron microscopy. Vincent and Alan speak with Erica about her career and her work on understanding the functions of proteins of Ebolaviruses, Marburg virus, and other hemorrhagic fever viruses, at ASM Microbe 2016 in Boston, MA. Esper and the Merry TWiXters analyze the latest data on Zika virus and microcephaly in Brazil, and discuss publications on a mouse model for disease, infection of a fetus, mosquito vector competence, and the cryo-EM structure of the virus particle. 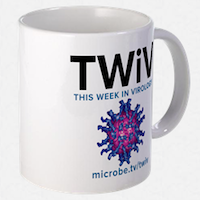 The TWiVeroos deliver the weekly Zika Report, then talk about a cryoEM structure of a plant virus that reveals how the RNA genome is packaged in the capsid, and MIMIVIRE, a CRISPR-like defense system in giant eukaryotic viruses.